Friday 28th September 2018 – 11:55am – Murray MacGregor. A man has died after a crash involving three HGVs on a motorway. The incident happened on the northbound M40 between Junctions 15-16 at about 4.15am this morning (Friday). Three ambulances and two paramedic officers were sent to the scene. A West Midlands Ambulance Service spokesman said: “On arrival, ambulance staff found two lorries that were on fire. A third lorry was just in front of them. “The third driver was uninjured. Friday 28th September 2018 – 10.00am – Murray MacGregor. One motorcyclist has died and another has suffered serious injuries after a crash involving two motorcycles and a car. It happened outside Summerhill School, in Lodge Lane, Kingswinford at about 7.10pm last night (Thursday). Three ambulances, a senior paramedic officer and the MERIT Trauma Doctor and critical care paramedic were sent to the scene. A West Midlands Ambulance Service said: “On arrival, ambulance staff found two motorcyclists who had been involved in a crash with a car. “The first motorcyclist had suffered serious injuries. He was taken on blue lights to the major trauma centre at Queen Elizabeth Hospital Birmingham with the doctor travelling with the crew. Sadly, he died later at hospital. “The other rider, a man in his 30s had suffered multiple injuries. He was treated at the scene before also being taken on blue lights to the major trauma centre at Queen Elizabeth Hospital Birmingham. Friday 28th September 2018 – 9.45am – Murray MacGregor. Two men have died after an incident on a dual carriageway. It happened at about 8.10pm on Thursday evening on the southbound A40 to the south of Whitchurch in Herefordshire, near the petrol station. A West Midlands Ambulance Service spokesman said: “On arrival, crews found a motorcyclist who had suffered very serious injuries. Unfortunately, there was nothing that could be done and he was confirmed dead at the scene. Friday 28th September 2018 – 8.25am – Murray MacGregor. A woman has died after the car she was in crashed. 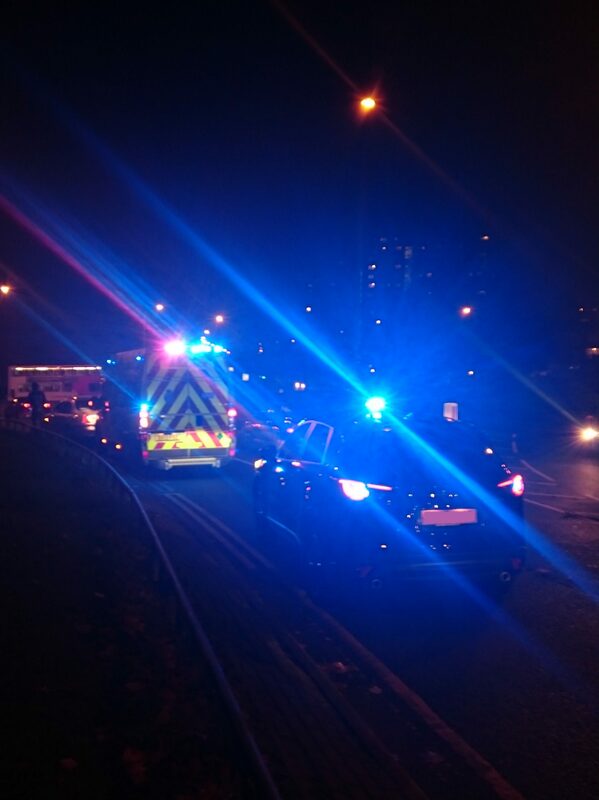 Two ambulances, a paramedic officer and the West Midlands CARE team were sent to the scene. A West Midlands Ambulance Service spokesman said: “On arrival ambulance staff found a car that had suffered significant damage. Thursday 27th September 2018 – 12.00pm – Murray MacGregor. A new report shows West Midlands Ambulance Service is the most efficient in the country. This remarkable success was achieved by being the only ambulance service in the country with a paramedic on every vehicle; having the most modern fleet with all vehicles standardised and none over five years old; and by using some of the most technologically advanced equipment. Together this means the Trust is able to discharge more patients at the scene than any other service, which brings real benefits to patients and hospitals as fewer patients are taken to A&E. The report by Lord Carter of Coles examines the differences between ambulance services in England. West Midlands Ambulance Service Chief Executive, Anthony Marsh, said: “We welcome the report as it recognises the extraordinary lengths that ambulance service staff go to, to help patients but also backs up many of the decisions this Trust has taken over several years. “Despite being one of the worst funded ambulance services in the country, our unique operating model means we are the only Trust in the country to consistently surpass all of the response targets. “We have invested heavily in our staff with update training every year. This helps us to achieve the second lowest conveyance rate in the country: only about half of patients are taken to hospital but we are confident that we can reduce that still further. “We have invested heavily in technology which is recognised nationally and internationally as a Global Digital Exemplar. We have one of the most technologically advanced control centres and over the last few years have rolled out our electronic patient record (EPR) to every vehicle. “The system automatically takes information from our diagnostic devices such as blood pressure cuff and ECGs and updates the electronic record. Via our clinical support desk, paramedics can also access previous records which can help in diagnosis. The information being recorded can also be seen in real time by the hospital staff as a patient is being conveyed so that the A&E Department can be better prepared for when the ambulance arrives. In addition, a copy of the record is sent electronically to the patient’s GP for their local records. “We have worked very hard over recent years to improve the support we provide to staff. As well as regular update training, all operational staff get mentored on the job, and we have also provided 24-hour management support on every ambulance station. “We also support them pastorally: we now have two physiotherapists helping staff who do get injured back to work. We have expanded our peer support networks for staff should they need any help after serious incidents. Together these allow us to have the lowest sickness rate in the country. “Lord Carter recognises the huge cost and frustration experienced by ambulance services dealing with the unacceptable hospital handover delays. It put a huge extra pressure on my staff, provides poor care for patients and means some patients wait far longer than they should have to, before they receive hospital care. “We were delighted to have a visit from Lord Carter earlier this year to see the progress we have made over the last five years. It was clear how impressed he was with what we do here in the West Midlands. 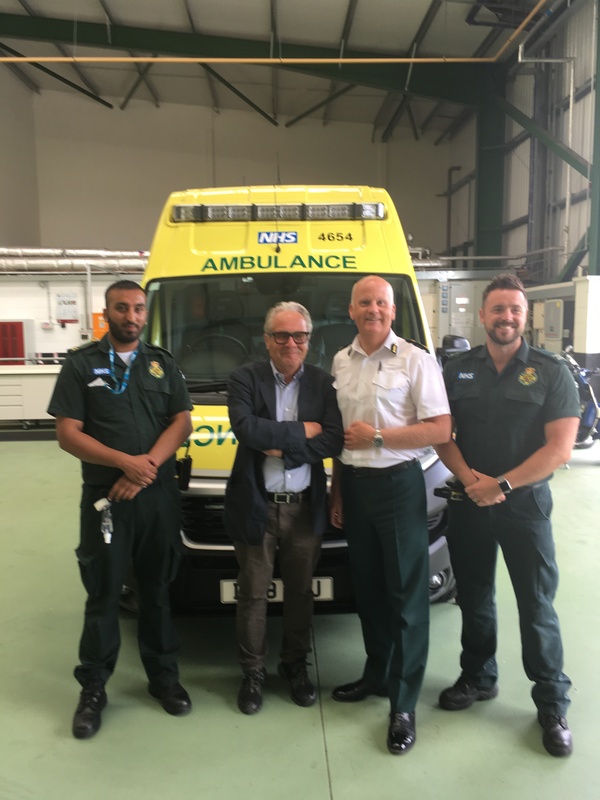 Picture shows (L-R) Student Paramedic Mohammed Azim, Lord Carter of Coles, WMAS Chief Executive Anthony Marsh, Clinical team mentor Leigh Watts. Thursday 27th September 2018 – 10.10am – Claire Brown. A man has sadly died following a road traffic collision on the M6 in Staffordshire this morning. 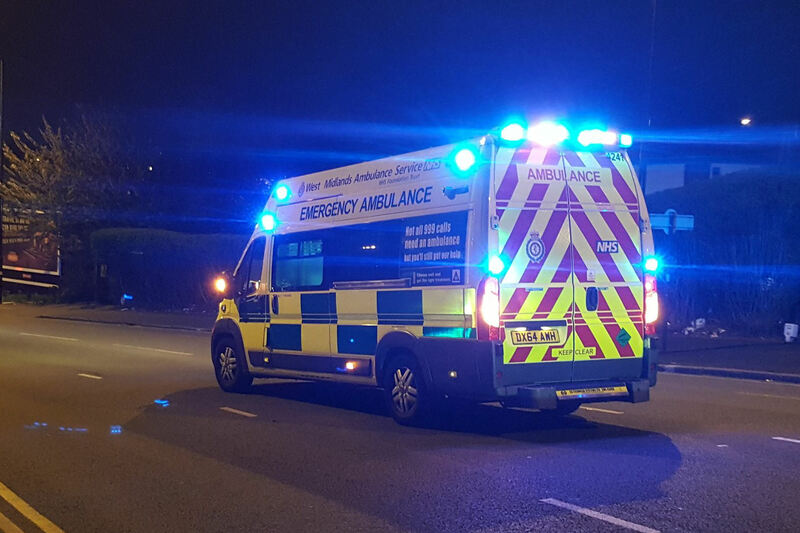 West Midlands Ambulance Service received a 999 call to reports of a collision involving a pedestrian and a lorry on the northbound carriageway of the M6 between junctions 15 and 16 at 6.19am (Thursday). Two ambulances, a paramedic officer and a BASICS emergency doctor were responded to the scene. A West Midlands Ambulance Service spokeswoman said: “When ambulance staff arrived they found a male pedestrian, the driver of a stationary vehicle, who was seriously injured and in cardiac arrest. The team worked together to commence advanced life support at the roadside. Sadly, despite their best efforts, nothing could be done to save the man and he was confirmed dead a short time later. Thursday 27th September 2018 – 9.30am – Claire Brown. A man and a woman needed hospital treatment after their car was involved in a collision with a tractor in Kidderminster yesterday. West Midlands Ambulance Service was called to the A456, near Rock Sports Youth Football Club in Callow Hill, Kidderminster, at 5.15pm yesterday (Wednesday). Two ambulances, a paramedic officer, the Midlands Air Ambulance from Strensham and a BASICS doctor from Mercia Accident Rescue Service (MARS) responded to the scene. A West Midlands Ambulance Service spokeswoman said: “When ambulance staff arrived they found a car and a tractor which had been involved in a serious collision. “A man, the passenger from the car, sustained multiple serious injuries in the collision. Ambulance staff worked with the fire service on scene to carefully extricate him from the car. The man was given pain relief, his wounds were dressed and he was immobilised with a neck collar and spinal board before being airlifted to Queen Elizabeth Hospital Birmingham for further trauma care. “The driver of the car, a woman, had managed to get out of the car unaided and was described as ‘walking wounded’ on scene. Ambulance staff assessed the woman and found she had sustained a head and hand injury. She was given treatment on scene before being taken by land ambulance to Worcestershire Royal Hospital. Who would deliberately target ambulances in brick attack? Wednesday 26th September 2018 – 9.40am – Murray MacGregor. 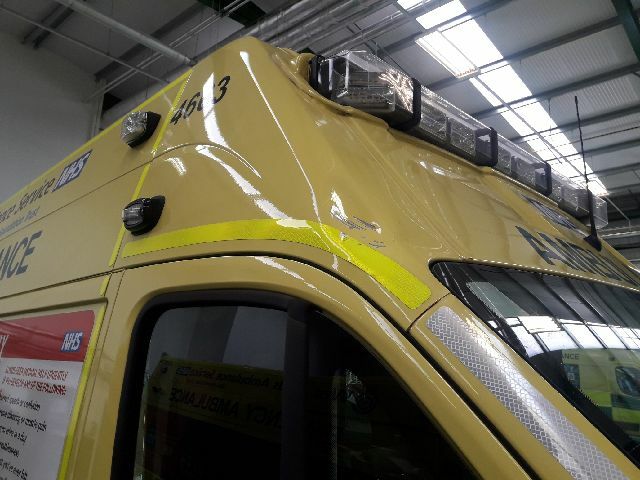 West Midlands Ambulance Service is appealing for the public’s help in apprehending the individual(s) who attacked not one, but two ambulances with bricks. The two incidents took place as the ambulance went through the underpass on Birchfield Road at the junction of Aston Lane in Birmingham at about 2.30pm on Tuesday afternoon; the second incident took place at the same location at around 3.00pm. In the first case, the vehicle was travelling on blue lights to a patient with breathing difficulties. 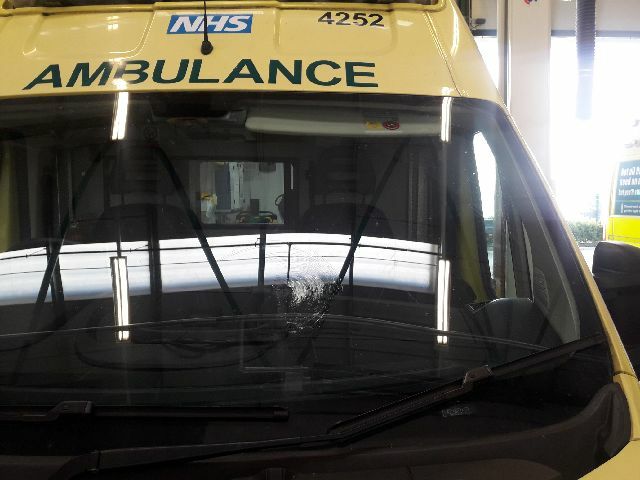 The ambulance crew had to stop as the windscreen was damaged and meant that a second ambulance had to be sent to the 999 call, resulting in a delay of around 10 minutes in getting help to the patient. In a bizarre twist, it was that second ambulance that was also targeted as it took the same patient to hospital. On this occasion, the crew heard a loud bang as they drove along, but it was only once they arrived at hospital that they discovered a dent in the ‘A Post’ just above the windscreen and driver’s door. Both vehicles are now off the road and it will cost hundreds of pounds to repair. Emergency Services Operations Delivery Director, Nathan Hudson, said: “It is hard to put into words how angry and disappointing these incidents are. “Throwing a brick at any vehicle is dangerous and idiotic, but when it is an ambulance responding to an emergency, it’s beggar’s belief. “Never mind that two vehicles are off the road which could be out helping to save lives, this was a horrendous incident for the staff involved. They do a difficult job at the best of times, but to have this sort of incident happen has understandably left them shocked and upset. I am just thankful that no-one was hurt. Anyone with information can contact West Midlands Police via Live Chat at www.west-midlands.police.uk between 8am and midnight, call 101 anytime or contact Crimestoppers anonymously on 0800 555 111. Quote log number 1364 of 25th September. Thursday 20th September 2018 – 4.30pm – Jamie Arrowsmith. A man has died following a single vehicle road traffic collision on the motorway this morning. West Midlands Ambulance Service was called to the M45, heading towards Rugby near to the junction for Dunchurch, at 11.33am and sent two ambulances and a paramedic officer to the scene. The Warwickshire and Northamptonshire Air Ambulance crew also responded in a rapid response car. A West Midlands Ambulance Service spokesman said: “On arrival, crews discovered a car that had been severely damaged after leaving the carriageway and colliding with a tree. “There was one patient, a man, who was found to be in cardiac arrest. Wednesday 19th September 2018 – 1.45pm – Jamie Arrowsmith. A man has been seriously injured after his lorry overturned on the motorway this morning in a single vehicle collision. West Midlands Ambulance Service was called to the incident between junctions 3 and 3A on the M42, near Redditch, at 11.44am and sent one ambulance, a paramedic officer, a senior paramedic, a BASICS doctor and the Warwickshire and Northamptonshire Air Ambulance to the scene. A West Midlands Ambulance Service spokesman said: “On arrival crews discovered two patients. The driver, a man believed to be in his 40s, was trapped in his cab as a result of the incident. “Ambulance staff assessed him and then worked closely with fire service colleagues to help him out of the vehicle. “He received specialist trauma care for a serious arm injury before being transported to Queen Elizabeth Hospital, Birmingham by land ambulance. The doctor travelled with the patient to help continue treatment en-route. Friday 14th September 2018 – 4.05pm – Jamie Arrowsmith. One man his died and a second has been seriously injured following a collision between a car and two pedestrians this morning. West Midlands Ambulance Service was called to Ansley Road in Stockingford, Nuneaton at 10.34am and sent four ambulances, a paramedic officer and the Warwickshire and Northamptonshire Air Ambulance to the scene. A West Midlands Ambulance Service spokesman said: “Crews arrived to discover three patients in total, two pedestrians and the driver of the car. “Unfortunately, one of the pedestrians, a man, had suffered extremely serious injuries in the collision. It quickly became apparent that nothing could be done to save him and he was confirmed dead at the scene. “The second pedestrian, also a man, received specialist trauma care for multiple serious injuries. He was anaesthetised in order to stabilise his condition before being transported to University Hospital Coventry and Warwickshire by land ambulance in a serious condition. Monday 10th September 2018 – 2.32pm – Murray MacGregor. A teenager has died after an RTC despite the efforts of ambulance and hospital staff. The incident happened on Wolverhampton Road in Quinton last night (Sunday 9th September) at about 11.45pm. An ambulance was on scene less than 3 minutes after the first 999 call and was backed up by a second ambulance, a paramedic officer the the MERIT trauma doctor and critical care paramedic. A West Midlands Ambulance Service spokesman said: “On arrival ambulance staff found an 18-year-old was whose motorbike had hit a tree. “Ambulance staff carried out life support and advanced trauma care at the scene before taking the man to the major trauma centre at Queen Elizabeth Hospital Birmingham. Anyone with information can call the West Midlands Police Serious Collision Investigation Unit on 101; quoting log number 2845 of 09/09/18. Monday 10th September 2018 – 9.25am – Murray MacGregor. Ambulance staff worked with firefighters to treat a man who was found at the bottom of a cliff near Bridgnorth before he was lowered to safety using ropes. Emergency services were called to High Rock, off Telford Road at 10.15pm lat night, Sunday. An ambulance, a paramedic officer, the Hazardous Area Response Team (HART) and a senior paramedic officer were sent to the scene. A West Midlands Ambulance Service spokesman said: “The man, who was in his 20s, was found at the bottom of a 25 metre cliff, thought it wasn’t clear how he had come to be there. “The man was complaining of back and shoulder pain. He was immobilised, had his injuries splinted and was given pain relief. The HART team then clipped the stretcher onto a rope system put in place by Shropshire Fire; the man was then lowered down a steep embankment before being taken to New Cross Hospital for further assessment and treatment. Ambulance staff also joined police and fire colleagues in a search of the area after reports that there could have been a second patient. Nothing was found and ambulance staff were stood down at about 2.50am (Monday). Wednesday 5th September 2018 – 3.50pm – Jamie Arrowsmith. A man has been treated for a serious leg injury by ambulance staff following a collision with a car outside the Bullring in Birmingham this afternoon. West Midlands Ambulance Service was called to the incident, outside Debenhams, at 2.18pm and sent two ambulances, a paramedic officer and the West Midlands Care Team to the scene. A West Midlands Ambulance Service spokesman said: “Crews arrived to find a man, believed to be in his 50s, who they were told had briefly been pinned against a wall following the collision. “Following assessment from ambulance staff the man was treated for a serious leg injury. He appeared to have avoided any other significant injuries in the collision. “He was immobilised and given pain relief before being transported to Queen Elizabeth Hospital for further treatment. Wednesday 5th September 2018 – 3.15pm – Claire Brown. A pedestrian needed advanced trauma care by ambulance staff this afternoon following a road traffic collision in Sutton Coldfield. West Midlands Ambulance Service received several 999 calls to reports of a car which had collided with a pedestrian and a shop window on Mere Green Road in Four Oaks, Sutton Coldfield, shortly before 1.00pm today (Wednesday). Two ambulances, a paramedic officer and the Warwickshire and Northamptonshire Air Ambulance with a doctor on board responded to the scene. A West Midlands Ambulance Service spokeswoman said: “Ambulance staff arrived to find a pedestrian, a woman, who was being cared for by passers-by after being involved in a collision with a car. “Upon assessment ambulance staff quickly established the woman had sustained multiple serious injuries which required advanced trauma care on scene. The team of ambulance staff worked to administer pain relief whilst stabilising her injuries before she was taken by land ambulance on blue lights to Queen Elizabeth Hospital Birmingham. Tuesday 4th September 2018 – 3.34pm – Murray MacGregor. An elderly cyclist has died after reports of an incident involving a car. An off-duty paramedic started resuscitation at the scene while two ambulances, a paramedic officer and the Warwickshire and Northamptonshire Air Ambulance were en-route.